RUSH: So Kirstjen Nielsen is out. You know, folks, my impression of her was that she was loyal and that she was tough and that she was out there begging for support. And so I was one, I don’t know of how many, that was surprised when I found out she was leaving. It’s really instructive to see how she is being blamed by the Democrats, instead of Trump. She’s become the whipping girl instead of Trump. 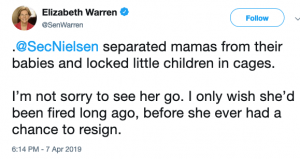 According to the Democrats and the media, which of course are one and the same, she is a horrible person for allowing Trump to put children in cages, which Trump did not do. Let’s go to the polling data on this. Rasmussen Reports: “For Voters, Illegal Immigration Remains Big Problem, But Not for Democrats.” That’s the headline. By the way, a reminder here, if you watch CNN or MSNBC, read the New York Times or Washington Post, you will not know what’s going on in the real world. Now, this is important to note. Voters by a wide margin expect borders to be respected and enforced. The Democrats don’t care who is coming across the border. Cartel members, human beings being trafficked, murderers, rapists, purse snatchers, it doesn’t matter to them, as long as they keep coming. That’s collateral damage in the war on American values, and that’s exactly what we are in the midst of, folks. Nielsen takes the blame for the failures of Trump and Congress. 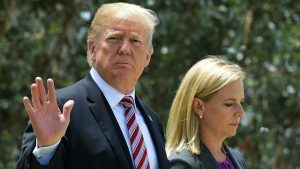 Homeland Security Secretary Kirstjen Nielsen informed President Trump on Sunday that she would be resigning in the wake of his administration’s sudden decision to drop the nomination of the leading candidate to head the U.S. Immigration and Customs Enforcement. Mr. Trump announced the resignation via Twitter later Sunday, thanking Ms. Nielsen for her service. He named U.S. Customs and Border Protection Commissioner Kevin McAleenan as Acting Secretary of Homeland Security. 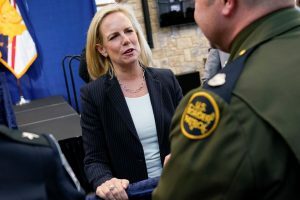 Ms. Nielsen, who joined the president on his trip to the U.S. border with Mexico on Friday, met with the president and his acting chief of staff Mick Mulvaney at the White House on Sunday, according to two people briefed on the discussion.